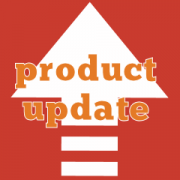 Fixed bug related to visibility of variable products. Variable products are now hidden if the “hide unavailable products” option is checked and none of the variations is available. Fixed bug in Admin UI. The bug caused the regional pricing boxes not to expand and collapse when the “product unavailable for region” option was selected/deselected. Improved handling of variable products. Added logic to hide variations when they are not available. The new logic also ensures that the price range of variable products excludes unavailable variations. Fixed bug in logic used to check if a product is purchasable function. The bug caused products to be considered “not purchasable” when the Currency Switcher was active and the prices were displayed in base currency. Added extra check while processing variable products. The new checks handle the condition in which a variable product has invalid children associated to it (it’s an uncommon edge condition). Removed redundant code. The redundant code was used to set customer’s currency when viewing an existing order, but it’s no longer required by current architecture. Refactored method Order::get_order_currency() to be compatible with parent class’ method signature. Optimised logic used to handle coupons. Coupon processing is now skipped when the base currency is active (the conversion would be ineffective, anyway). Added new WC_Aelia_CurrencyPrices_Manager::convert_product_price_from_base() method. The new method will be used exclusively to convert product prices, and it uses a filter to allow 3rd parties to modify the result of the conversion (for example, to implement a custom rounding logic). We are happy to announce that the SkyVerge Team acquired our Braintree Extended plugin. Our product’s multi-account features and Kount integration are now part of the official Braintree plugin, and available out of the box. 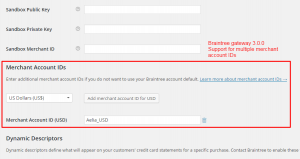 Starting from version 3.0 of the Braintree payment plugin, you will be able to specify a merchant account for each of the currencies provided by our Currency Switcher for WooCommerce, without having to install a separate extension. The logic we originally implemented in our Braintree Extended plugin has been preserved and improved, allowing you to accept payments in multiple currencies straight away. If you will update your Braintree gateway to version 3.0, you will no longer need the Aelia Braintree Extended plugin, as the features it provides are now included in the official gateway. You will have the same feature set, with a single plugin installed. Take note of the merchant account ID associated with each currency. You can find this information by going to WooCommerce > Checkout > Braintree. Disable and remove the Braintree Extended gateway. This is very important, as the plugin won’t work properly with the Braintree gateway 3.0. Update the official Braintree gateway to version 3.0. 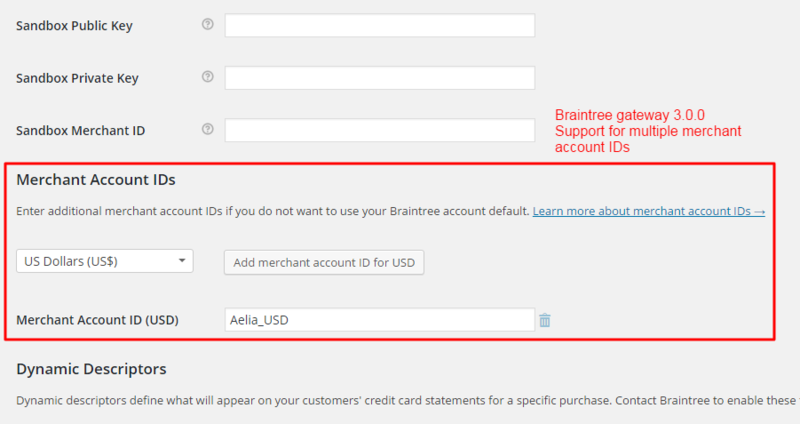 Go to WooCommerce > Checkout > Braintree and complete the configuration by assigning the merchant account IDs you saved at step #1 to their respective currency (see screenshot below). The new interface in the Braintree gateway 3.0 allows to enter multiple merchant IDs, assigning them to the appropriate currency. This reconfiguration is required because the new Braintree plugin uses a slightly different setup, and you will have to do it only once. After completing the steps above, your payment will be sent again to the appropriate Braintree merchant account ID, depending on the currency. In quality of SkyVerge collaborators, we are excited at the idea that one of the leading WooCommerce developers acquired one of our solutions and included its features in their official products. To us, this is an important recognition of the effort we put in developing our plugins, and a validation of our ideas. This acquisition is an important step towards a full integration between our solutions and some of the most important WooCommerce products on the market. We will keep working with top class developers, such as SkyVerge and Prospress (authors of the popular Subscriptions plugin), to offer you the most powerful, reliable set of internationalisation features on the market. Expect more great news soon from Aelia! See you at the WooCommerce Meetup! Aelia’s founder, Diego Zanella, will be the guest speaker at the Dublin WooCommerce Meetup on the 11th November. The topic of the meetup will be “Secrets of a WordPress Plugin Developer”. Our founder will go through the process we follow to create our solutions, from the conception to the support of the finished product. What is a plugin, and how it differs from other types of software. How to find ideas for a WordPress plugin. The meetup is kindly organised by Rodolfo, owner of BusinessBloomer, hosted by Realex Payments, and it’s 100% free. In case you are still undecided, there will be free pizza and free drinks (including beer). You won’t find a better deal, you can’t miss it! 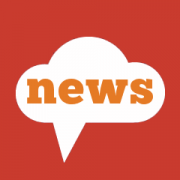 https://aelia.co/wp-content/uploads/2014/08/article-badge-aelia-news.png 240 240 diego https://aelia.co/wp-content/uploads/2014/07/AeliaLogo_201310.png diego2015-11-09 17:52:532015-11-09 17:53:27See you at the WooCommerce Meetup! Optimised performance of currency conversion logic. The new logic makes the Currency Switcher more efficient on sites that contain a large amount of variations, helping to improve page load times. Of course, using a dynamic caching solution on such type of sites is highly advisable. Improved robustness of internal conversion manager class. We added extra checks to improve fault tolerance. The changes are especially focused on handling possible errors that could be caused by customisations, or 3rd party plugins, that could make premature calls to currency conversion functions. Improved coupon handling hook to handle edge conditions. In some cases, especially when sites are running custom code not written by Aelia, hooks related to WooCommerce coupons could be triggered before the woocommerce_loaded event. This would prevent the coupon amounts from being converted correctly. The new logic handles such case.